Most of the women I’ve met in Chamonix are here because of their husbands. Sure, they may like it here and have some semblance of a community, but it’s because their husbands are keen outdoorsman, or simply want to be here, that they live and remain in Chamonix, away from their families. My circumstances are the same. Within this breed of women in the Chamonix valley, are the alpine guides’ wives. The guides work very hard throughout the winter and the summer. 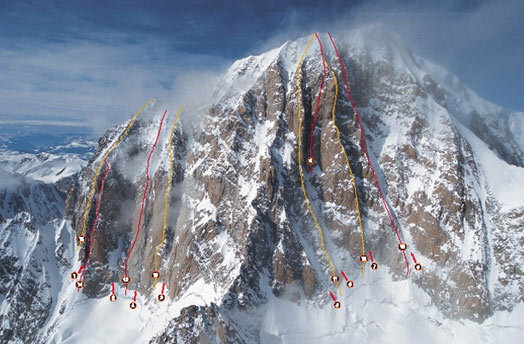 Their primary work is hauling ‘punters’ up and down the Mont Blanc. They’ll be gone for several days at a time for a given tour, sleeping in huts and climbing by day. Then they’ll return home, unpack, rest a little (though many of them are so avid they go out and cycle or ski, depending on the season), re pack, and do it again. What this means is that these women are, for all intents and purposes, single mothers. On top of these daily trials, there are the perils that a guide faces: death, skin cancer, injury before an already early retirement (then what?!). I saw a study online conducted by German doctors. It states that ‘for reasons of their outdoor work, mountain guides are heavily exposed to ultraviolet radiation.’ In their study of 283 men, precancerous lesions were more frequent in guides than in the general population (25% vs. 7%). I then tried to find some statistics on death by climbing in various places, but the information online is disparate – there doesn’t seem to be one central information source, an organisation that oversees such matters. What I did find is that according to the American Alpine Club, there are only 25 climbing deaths on average a year throughout the U.S.A. When I asked a guide here about this, he snorted and said, “Humph. Amateurs. That many die in a winter here. Mostly in avalanches.” Of course he was joking, but it’s not far off. I’ve read in the local newspapers over the last couple of winters in Chamonix repeated reports of folks dying up on the mountain. I’ve seen the rescue helicopters carrying a body on the outside, in a flat plastic gurney, which isn’t a good sign. That said, one of the ‘8000’ers, (mountains above 8k meters), Annapurna in Asia, a desirable mountain for climbers to try out, has a death rate of 38%! That means 38% of those who climb it die. But that’s not Mont Blanc. And most of those who die here are not guides, though the general consensus is that it’s about three or four a year who do lose their lives. Mountain climbing isn’t even on the list! And note what IS the highest rate of casualty – and with a huge frequency! Geez, here I thought I’m lazy, giving all these sports and dangers that those around me encounter, and yet I’m being courageous by trying to bring a life into this world!